Interests - Tom and Jerry, outdoor games with little sister, Spongebob, DS, Playstation 3 and watching films. Olivia loves the film titanic and anything to do with it. Olivia was diagnosed with Neuroblastoma stage 4 cancer at the age of 4 after limping and a series of back pains and fatigue. She’s had the general protocol of treatment for Neuroblastoma, high dose chemo, surgery radiation, repeat chemo and transplant from the NHS at Glasgows Yorkhill Hospital and Royal Aberdeen Children’s Hospital. She then went to Germany with her family to have immunotherapy treatment and had 5 doses of the immunotherapy. 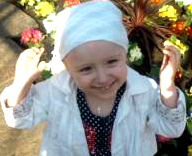 Sadly whilst on this treatment Germany discovered Olivia had relapsed in her ribs so the treatment stopped. After the news of relapse, Olivia started another German treatment called RIST therapy which is another form of chemotherapy. It hit her hard she was often hospitalised due to the side effects and infections. It helped for a few months by shrinking the tumours, but soon the tumours spread whilst on treatment so it had to stop. Olivia has since twice been to the Hufeland clinic in Germany to detoxify her body of all the poison from the treatments and cancer and have some holistic therapies. Recent scans in March 2012 have show Olivia’s disease has spread extensively throughout the spine ribs and pelvis area including shoulder blade. Her Mum and Dad have been giving her photodynamic therapy every day along with ultrasound treatment, infrared sauna and a range of vitamins. Doctors have said that her cancer can not be cured, but her mum and dad refuse to focus on this and won’t give up on their little princess who they worship. Olivia is has a little sister Jessica 20 months old and is due a new brother or sister in September. On the 6th of June we heard Olivia has gone downhill, she is confined to bed and feeling sad. Her parents are looking at treatment options in Mexico. Please send lots of cheerful smiles to Olivia. We are very sad to say Olivia passed away this morning. She became very ill whilst having treatment in Mexico and members of the public were moved by Olivia’s story and donated money to fly her home on life support. She passed away with her family by her side.